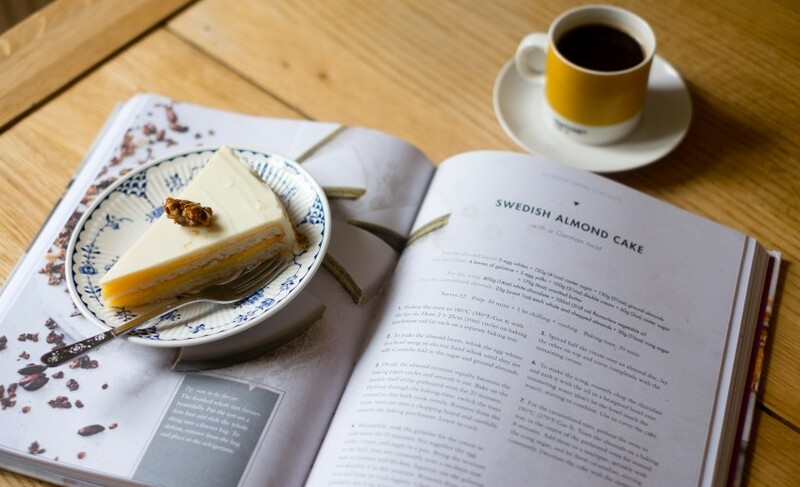 I have quite a big selection of patisserie books now, so when I add one to my collection it needs to include a mix of recipes I don’t already have, a twist on some classic recipes and lots of pictures detailing intricate steps and the finished dish. Christian Hümbs is a German patissier who is a judge on the German Bake-Off and was named German Patissier of the year in 2014. He’s worked at a host of Michelin starred restaurants and hotels. 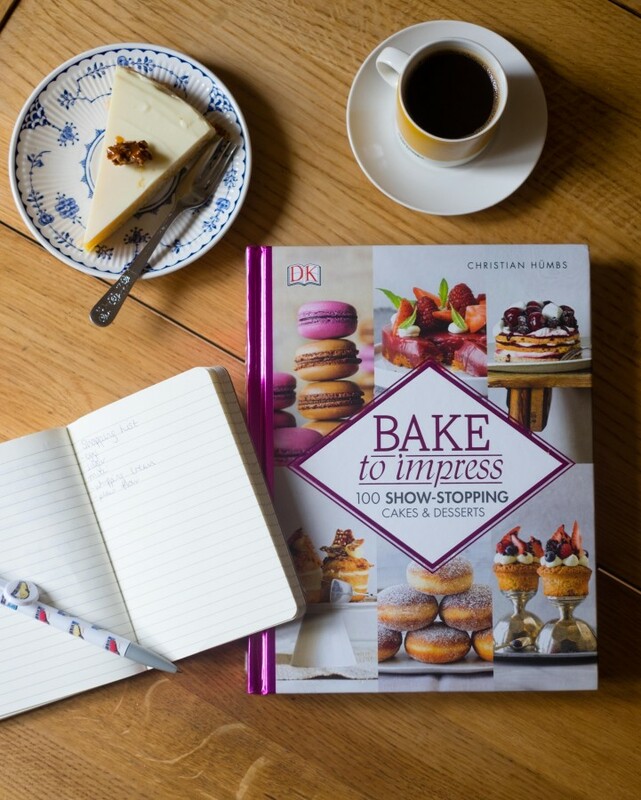 Despite working in the industry for 16 years, Bake to Impress is his first cookery book. Bake to Impress is broken down into different sections so that you can easily pick the kind of bake you want to make. 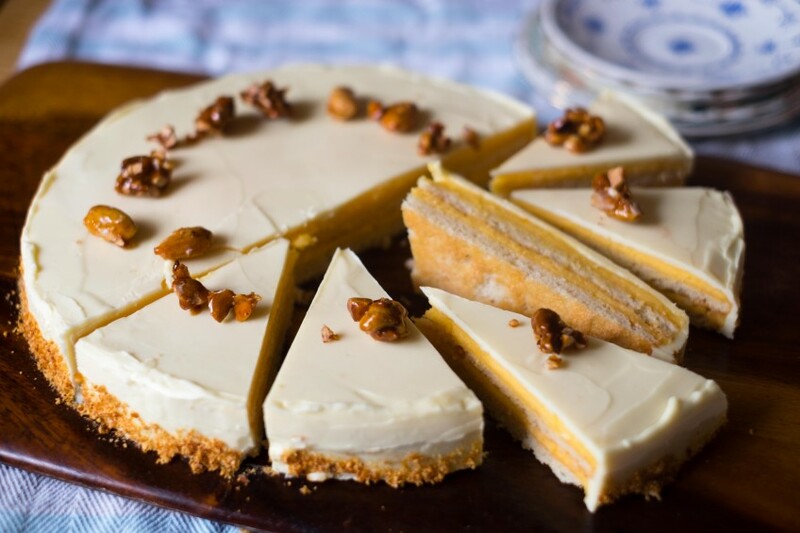 Quick & Easy, International Classics, Special & Unusual, Master Baking to Impress. So you can choose a section depending on how you feel, but as Hümbs writes, even if you picked something from the Quick & Easy chapter, always be sure to allow enough time for baking. If you rush your baking, you’ll never get the desired results. This book surprisingly has a lot of muffin and cupcake recipes which I wouldn’t normally expect to see much of in a patisserie book. There are plenty of classic and more challenging recipes in the book, which will keep you busy in the kitchen. I chose this Swedish almond cake, because I’d never seen anything like it before. It required very little equipment, just a stepped palette knife and some baking trays. I used a stand mixer to create this recipe, but you could just as easily use an electric whisk. Or if you really feel like testing yourself, you could whisk your egg whites by hand. Overall, I was pleasantly surprised by ‘Bake to Impress’ there are lots of recipes featuring lesser known products like yuzu and matcha and recipes for Cronuts. I would say that this book is very much for the keen cook. A lot of the methods do not go into a large amount of detail, compared to other patisserie books I have used. For example, glazes are usually applied at specific temperatures so that you get the best coverage. I struggled with the white chocolate glaze, even after I allowed it to cool, it still trickled off the cake and barely provided any coverage. So I re-glazed it with the excess after chilling it, then the glaze was too cool and it set almost instantly. Some information about the optimum temperature would have been very useful. 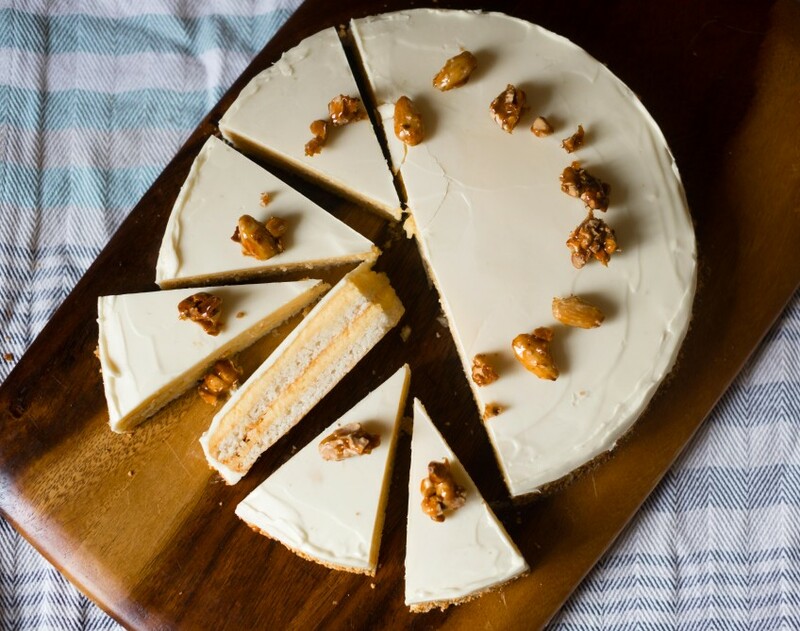 When cutting the cake, if you don’t want to crack the white chocolate glaze, you can warm the knife so that it melts through the glaze and gives a clean cut. 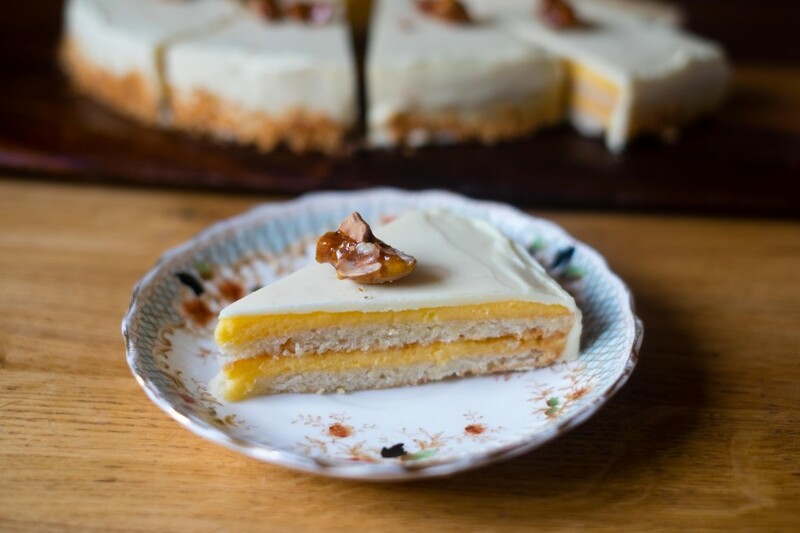 To create the Swedish almond cake, you can find the recipe here, with a few of my own notes. Preheat the oven to 180C Fan/200C/350F/Gas 4. Draw two 25cm circles on baking parchment and lay each on a separate baking tray. To make the almond layers, whisk the egg whites in the bowl of a stand mixer until they are stiff. Carefully fold in the sugar and ground almonds. Divide the almond mixture equally between the baking paper circles and smooth it out. Bake in the preheated oven for 20 minutes. Halfway through the baking time, turn the trays around so they cook evenly. Remove from the oven and turn out onto a board and carefully remove the baking parchment. Leave to cool. Meanwhile soak the gelatine for the cream in cold for 10 minutes. Stir together the egg yolks, cream and sugar in a pan. Bring the mixture to a boil and then stir constantly over a medium heat, until it simmers and thickens. Squeeze out the gelatine and dissolve it in the cream mixture. Remove from the heat and leave to cool slightly. Add the diced butter and gradually stir it in. Place in a bowl, cover the surface with cling-film and place in the fridge for around an hour. Spread half the cream over an almond disc, lay the other on top and cover with the remaining cream. To make the icing place the white chocolate with the oil in a heatproof bowl over simmering water (don't let the bowl touch the water), stirring to combine. Use to cover the cake. For the caramelised nuts, preheat the oven to 180C Fan/200C/350F/Gas 4.Toast the almonds on a baking tray in the centre of the oven for around 8 minutes. Add them to a saucepan, sprinkle with the icing sugar and let them caramelize, stirring constantly. 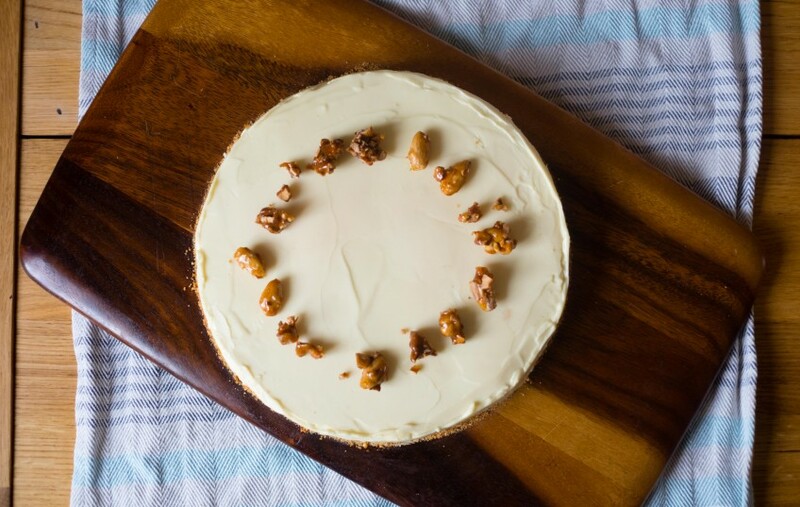 Decorate the cake with the almonds. To glaze the cake make sure the glaze is around 30C and chill the cake, so that the glaze doesn't just drip off. When you cut the cake, warm a knife slightly in hot water so that it glides through the white chocolate glaze instead of snapping it. If you don't have any baking trays big enough for a 25cm cake, you can make the rounds 23cm and it will work just fine. Another lovely bake! It took me a while to come around to almond cake and now I actually like it. The almond flavoring always left a weird aftertaste. I’d bake a chocolate cake with chocolate ganache filling and icing. I’d bake some really pretty macarons. My usual bake to impress is a rich chocolate cake, but I would like to learn some more impressive bakes. Another absolutely gorgeous and delicious creation. Needless to say you executed it perfectly as always! My mum’s lime and coconut cake is wonderful and always impresses her guests. A light sponge, filled with proper butter cream and homemade strawberry jam, or maybe even rhubard jam, homemade of course. I’d bake a dark chocolate cake with ganache, and caramel decorations.